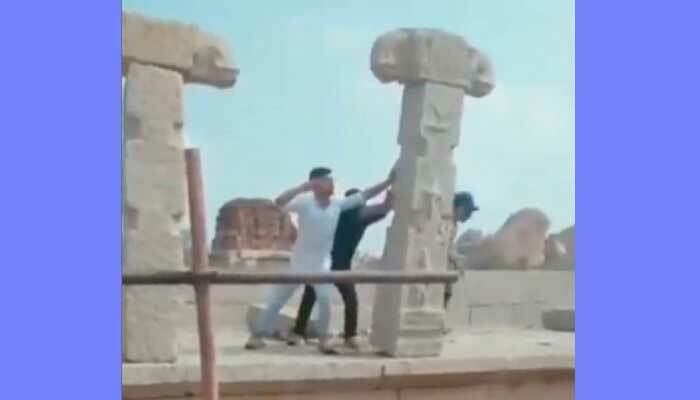 Hampi : The police on Thursday detained three persons for vandalising the pillar of Vishnu Temple at World Heritage site Hampi. “A group of five youths – four from Bihar and one from Madhya Pradesh – had come to Hampi. Of which, one youth went on a Hampi round on his own. The remaining youths had indulged in vandalising stone pillar of Vishnu Temple. They captured their act on a mobile phone,” the SP said. “The youths told the police that they pushed just one pillar to the ground for fun and that four pillars were already on the ground. They informed the police that they were not aware of the historic significance of the UNESCO site and further added that they are getting threat calls,” Arun Rangarajan said. Since the probe is underway, the names and other details of the suspects will not be revealed at this stage. The Archaeological Survey of India has claimed that the incident may have happened a year ago. The probe will ascertain the exact time of the incident, the SP said. Four teams under SIs Kalinga, Chandan, Mohammad Ghouse and Pampanagouda were formed to probe into the incident. The incident of felling pillar had gone viral on the social media which several organisations had staged protests demanding action against the culprits.